Last edited by X5SND; 06-17-2013 at 09:56 PM. I did this a week ago. I am looking for one that is X5 specific, but I remembered this write up from my old E36 days. Hey guys thanks for the replies! Im going to be starting this next weekend. Ill post pics and try and organize it into a how-to for the people interested! We demand you to do a write-up. Ok so Heres and update and hopefully some useful info for those of you looking to redo your headliner and/or just remove the headliner. For those of you with a Pano-Roof, much of this guide (pretty much all, actually) remains the same with the exception of a few more clips. See the blue text at the bottom of this post. Ok so first, there's probably more than one route you could take to get the darn thing out, but this is mine, and I managed it with out having to take any part of the sunroof out. I had to take some additional steps to get the headliner to tilt enough to clear my sub/amp enclosure, so some of the pictures may show more pieces removed than I mention. Note: There I made some assumptions in this guide, mainly that you have an idea of whats involved. I Didnt post the exact sizes of torx or hex tips you need as I assume if you're in a position of taking on a task like this you already probably have the necessary tools. First remove the cargo cover & fold rear seats down. slide front seats all the way forward, tilt all the way back. You may need some additional wiggle room later on so as a precaution, I recommend removing the front head rests. Its a basic game of EVERYTHING MUST GO! Sun Visors: Pop the cap off, remove the 2 torx screws, pull down and disconnect wire. Vanity Light: Simple pop down and unplug. Overhead Console: 4 Torx---Use small flat-head screw driver to pop out light bar and expose the 2 torx behind. Open Sunglasses holder and you'll see the other 2 holding up the console. Then its another case of unplugging wires. Oh-Sh!t Handles: Pull Handle down, then use a small flat head to open the caps at the end and expose the 2 torx screws behind. You dont need to take them right out.....after it about 3/4 of the way out you should be able to just pull the handle out. Accessory Hook: Slide the cap back, there's a clip that you need to push with the tip of the screw driver to slide the cap completely off. (If you have a narrow enough torx tip or are using Keys you wont need to slide the cap completely off.) Once you have the screw out, you have to wiggle the cap out...BE CAREFUL with this step as the clips are pretty fragile and easily broken. I Just took my time wiggling it left and right and they popped right out. Center Console/Alarm Box: Pop the light bar out like we did on the front, then theres a single phillips that needs to come out. If you can see the wires for the alarm box, you can unplug them now, or wait until the headliner drops a bit. 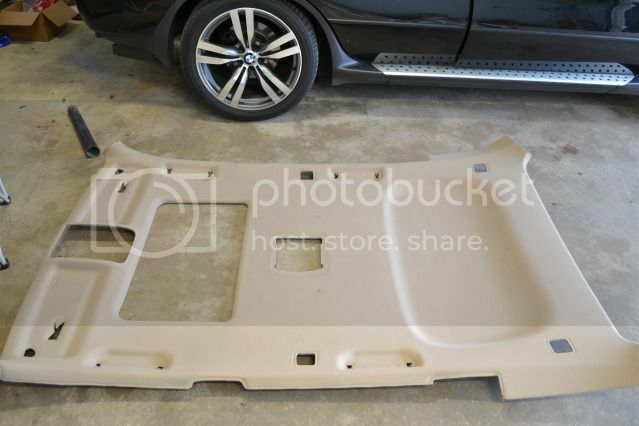 Once the headliner is out, the cover pops off, then use a screwdriver to pry apart the black rings left on the headliner. There are ones all the way around, but I managed to get all the back ones by sliding the glass almost all the way open, tugging down on the headliner and using a small torx at the same time to loosen them with my finger. Next up is the pillars. A-Pillar: Pop the airbag cap off and remove torx screw. Then just pull out and up. B-Pillar: Only the top half has to come out. Pull The top out and towards the center of the vehicle and lift the bottom at the same time. C-Pillar: Pull the "wedge" piece of back seat on either side out. Pop off the "xmas tree" cap, then just pull the whole pillar cover towards the inside of the vehicle. D-Pillar: Im Not sure if this one actually HAS to come out, but I couldn't move my liner far enough ahead to get around it. There is 2 phillips screws that need to come out, one is alread exposed, the other is behind the cap for the tailgate catch. I also had to remove the spring tail gate flap/sill assembly, in order to have enough wiggle room to get the pillar cover off. Its pretty straight forward, just a bunch of phillips screws, one is on the inside of the lip in the center underneath the load floor. Now both pillars should pop off and wiggle free. Use caution and patience around the tail gate catch, use a flat head screwdriver to get the plastic past the weather stripping. Now take that big straight screw driver, and there are 3 clips holding up the rear of the liner. Pull the weather stripping stick in straight screwdriver and twist the head to a vertical position to pry the clips down. 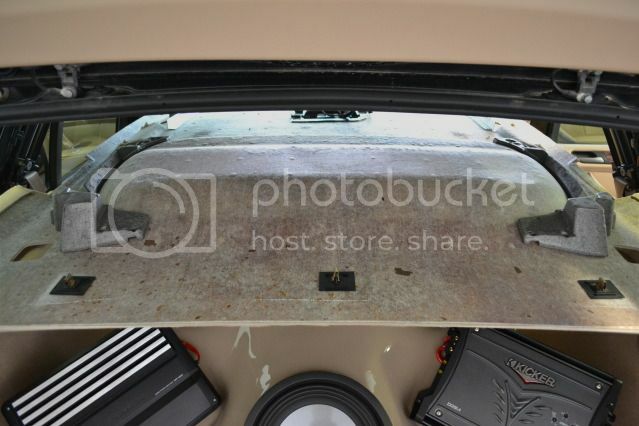 Once the headliner is all free and loose, angle it to get it out. It may be best to find an extra set of hands for this task. Below is what it'll look like once everything is off, and its out of the truck. 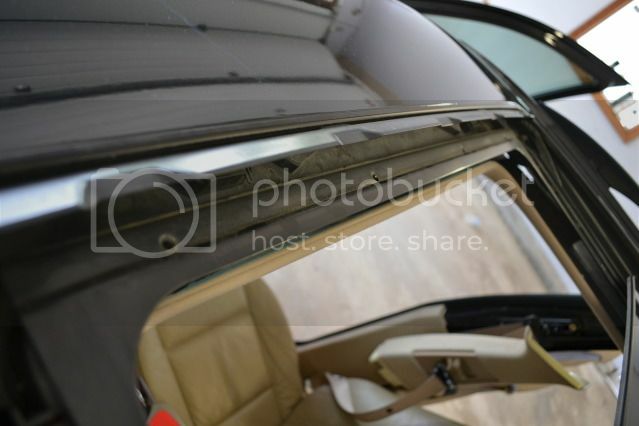 Pano-Roof Owners (Courtesy of forum member Clockwork): "the white clips are part # 51447123304. they are the plastic wedge clips that snaps the headliner to the edge of the moon roof's perimeter. The front of the moon roof has 4 screws, but the other 3 sides are these white snaps that slide into a track. there are 14 of them. 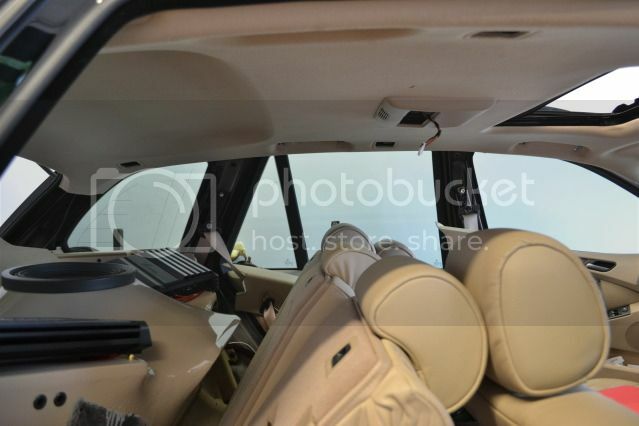 OH and removing the map/opera light console requires the removal of the clear light bar (pry out with flat-head between clear and colored plastic slit, and removal of security sensor panel (I guess this is where an optional sun glasses holder is) needs to be done also to expose the 4 torx screws." Last edited by X5SND; 06-17-2013 at 08:11 PM.